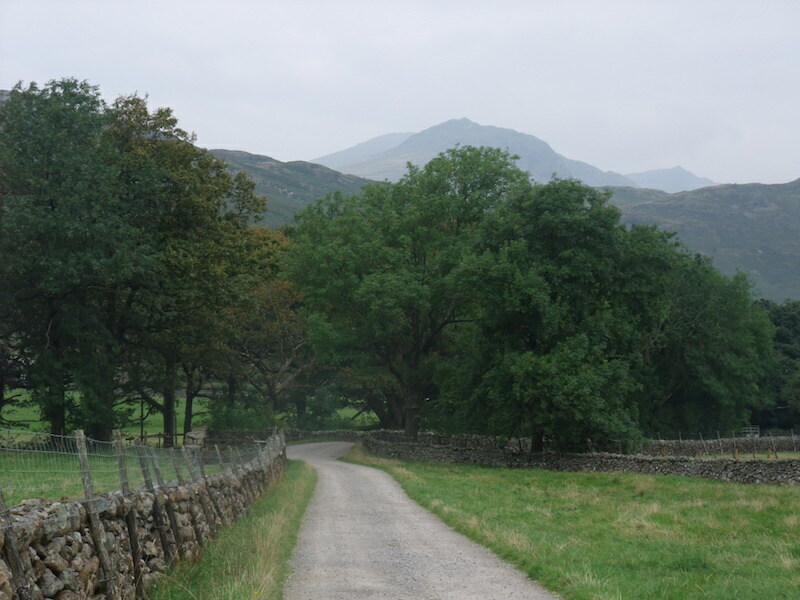 A long drive for us today as we travel from east to west across the county to Eskdale. 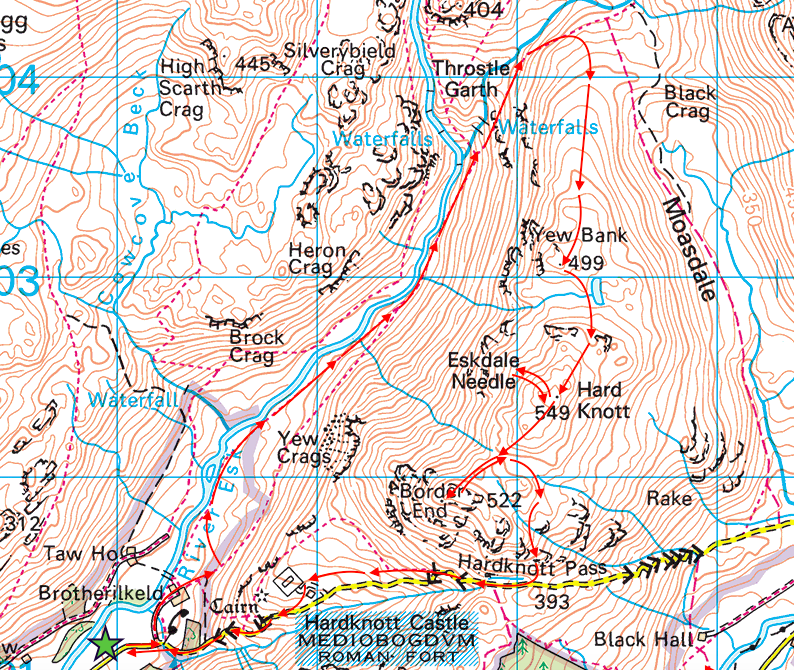 This is a walk we have wanted to do for a while but, as its a round trip of about 100 miles, we needed a good weather day to enjoy the views and make the trip worthwhile. The settled spell of good weather was forecast to continue so off we went. The car is parked in a small lay-by behind us and here we are walking along the lane to the starting point of the walk. This is where we turn left into Eskdale. 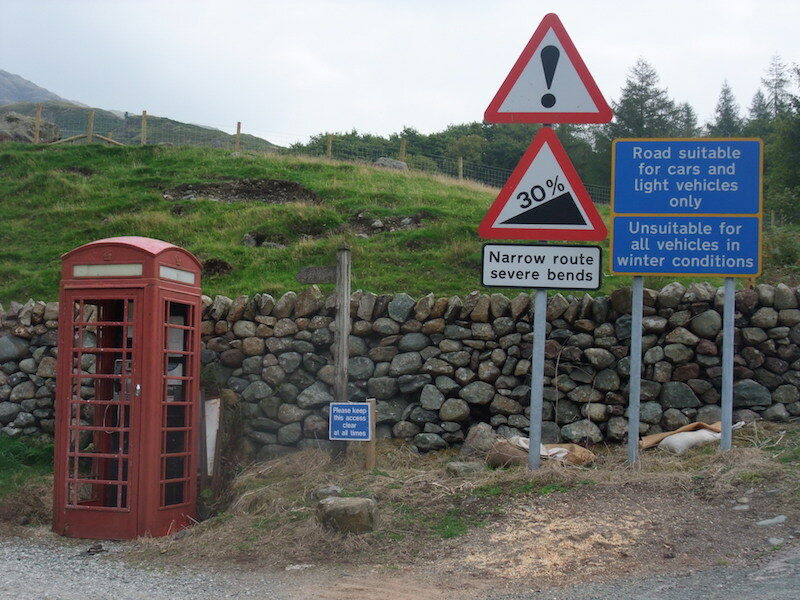 There are plenty of warning signs for motorists at the bottom of Hard Knott Pass and its as tricky to negotiate as the signs indicate. Unwary holidaymakers sometimes find themselves in difficulties even during the summer months never mind the winter ones. Walking down the Brotherilkeld Farm lane which we turned onto, just by all those road warning signs. 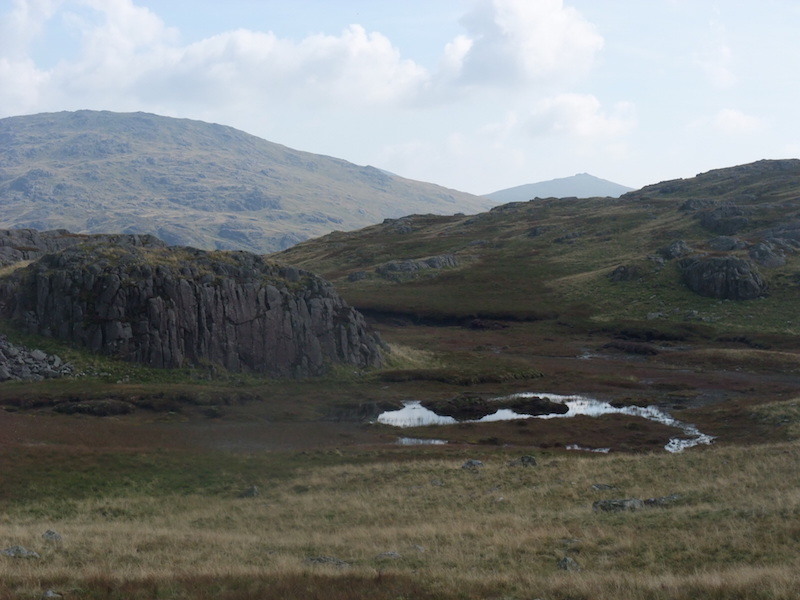 Looking across at Border End from the Eskdale path. 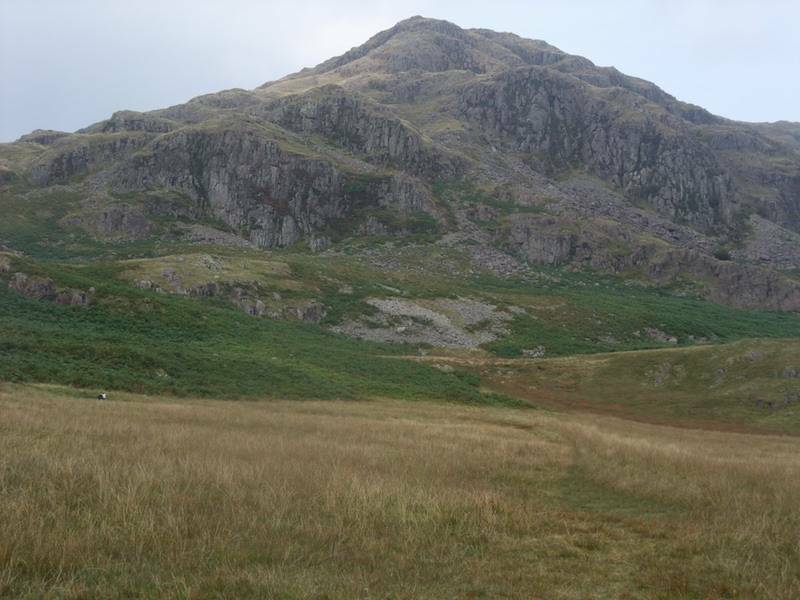 Border End is the south western end of Hard Knott, the summit of which is set further back so its not visible from here. 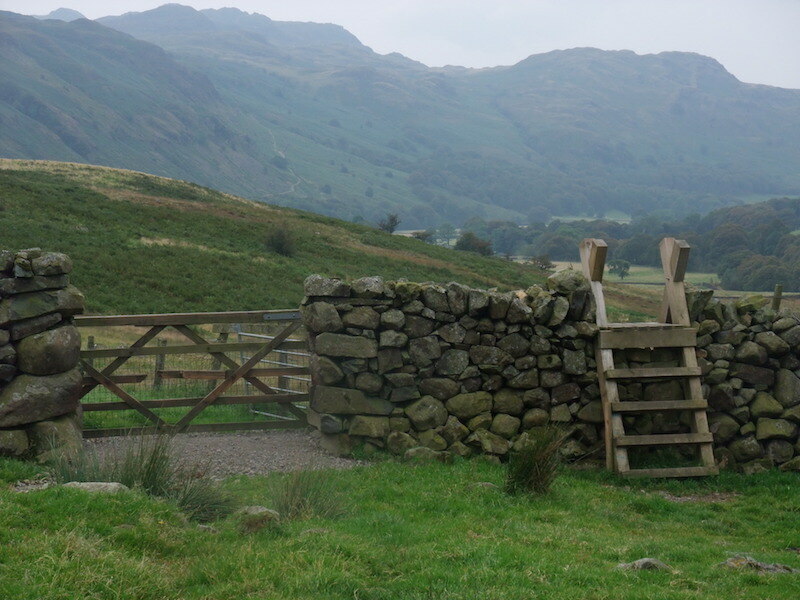 Make your mind up time, stile or gate? 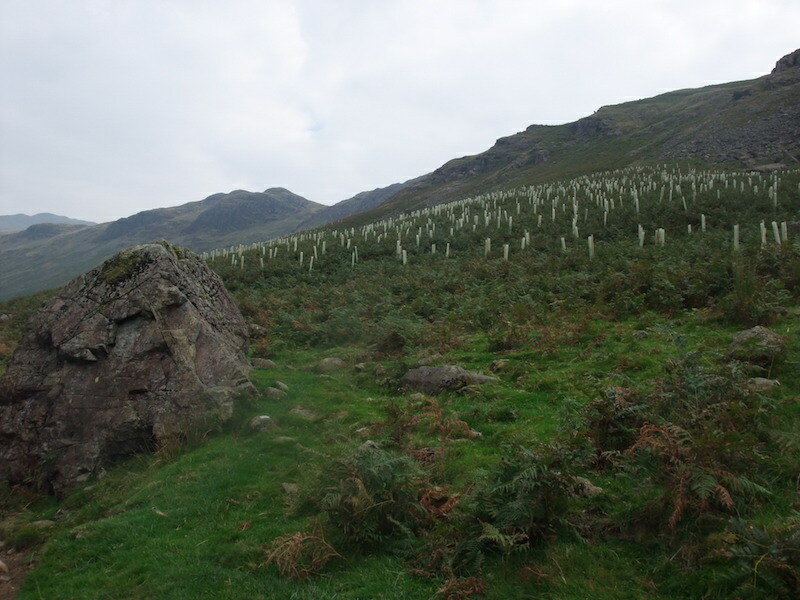 Dozens of ‘Tubus Plasticus’ on the lower slopes of Hard Knott. I know the idea is to protect the young trees with these plastic tubes but on the whole they don’t seem to have much effect, every time I peer inside to see how the young trees are doing they’re either dead or non-existent. Very few seem to thrive, or perhaps I’m just unlucky with the tubes I choose to peer into. 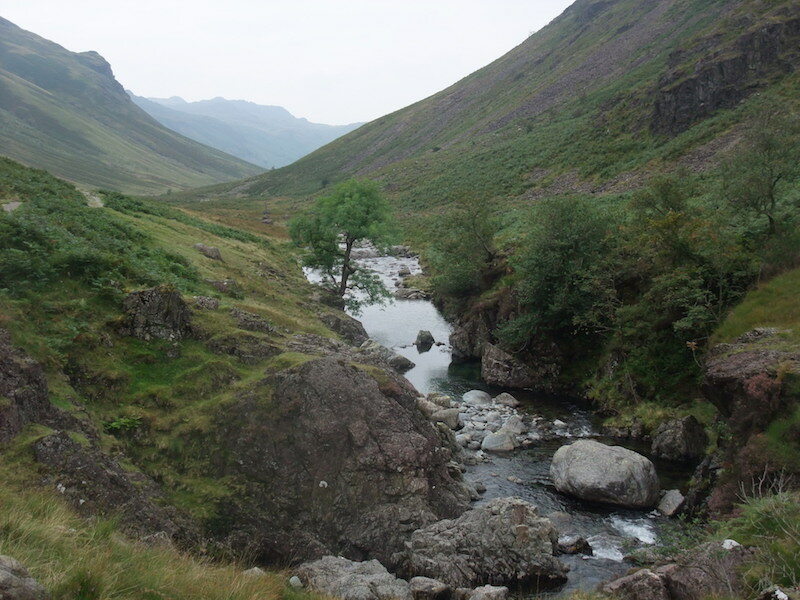 Looking down at the River Esk. 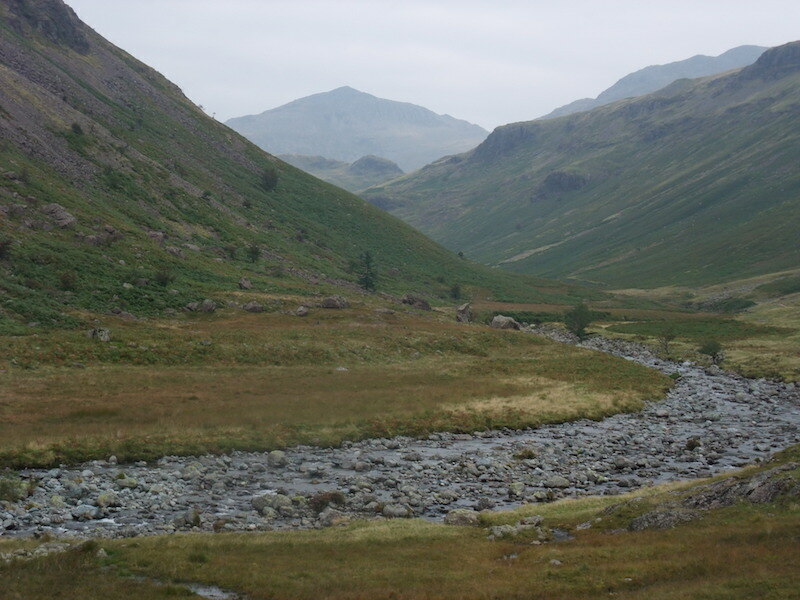 Low water levels in the Esk. We moved down from the path to walk alongside the river for a while. 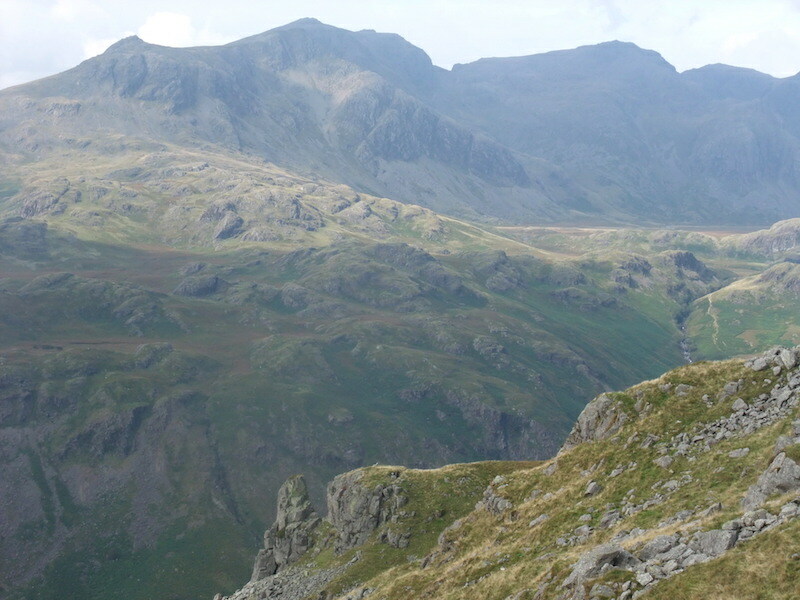 Bowfell is on the skyline in the centre, its always in view as you walk along here. 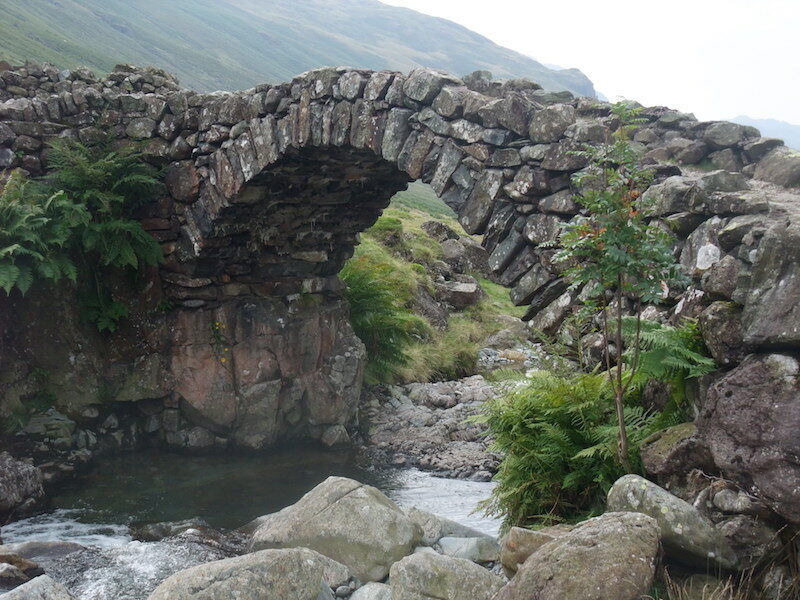 Its a very pleasant and easy two mile walk up the valley to Lingcove Bridge and if we lived nearer to it I would walk it as often as I could. Further along the path and one of the many waterfalls along the way. 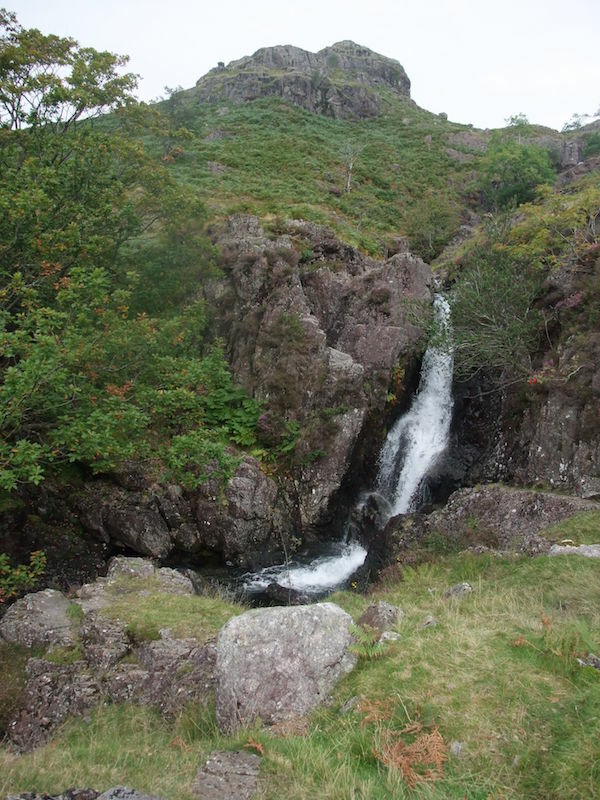 There are a few more in the distance too, so if you like waterfalls this is the place to come. More waterfalls as the crystal clear river carves its way through the rising ground as we get nearer the bridge. 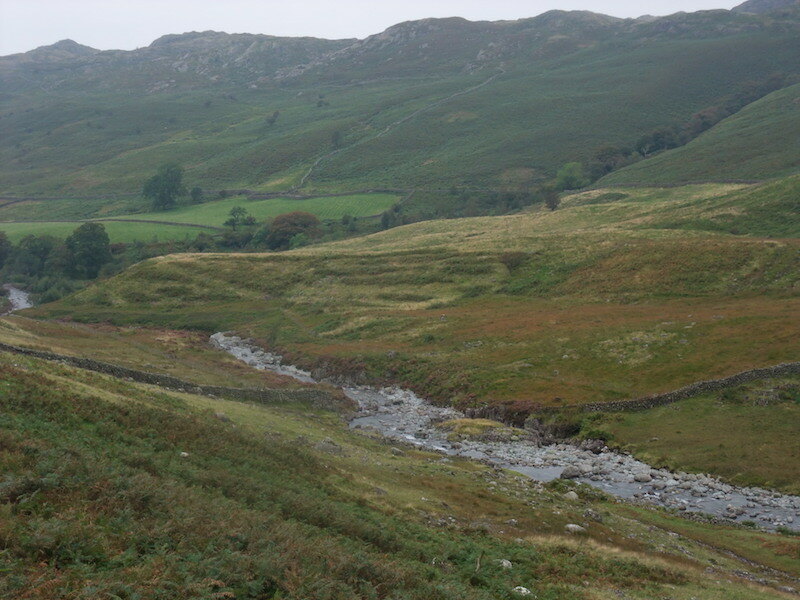 Looking down Eskdale from the area near the bridge. 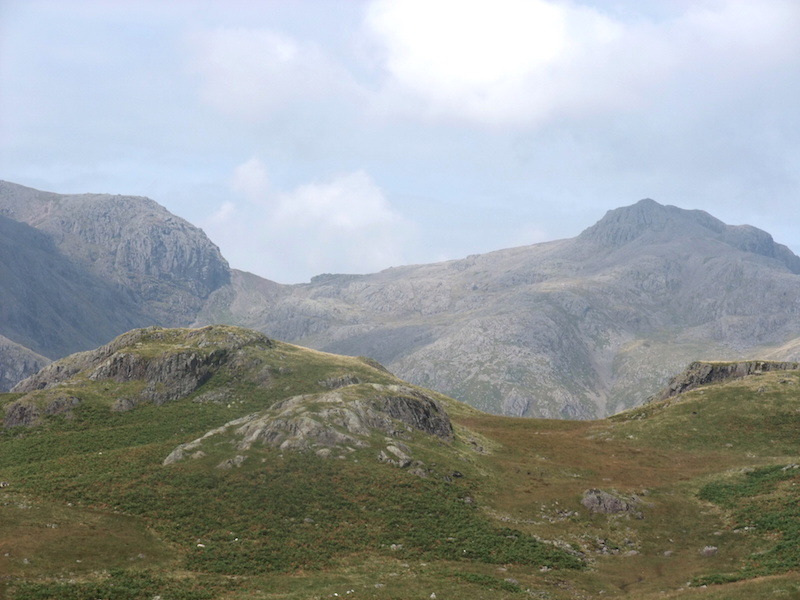 The craggy area to the top left is where the Eskdale Needle is located although it is a bit difficult to see it from here. 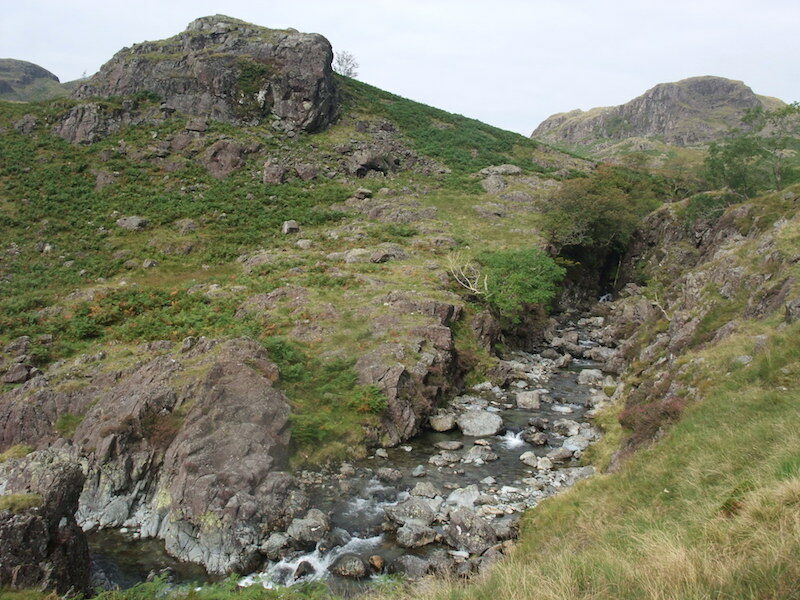 Maybe there will be a good view of it when we get over on to Hard Knott. 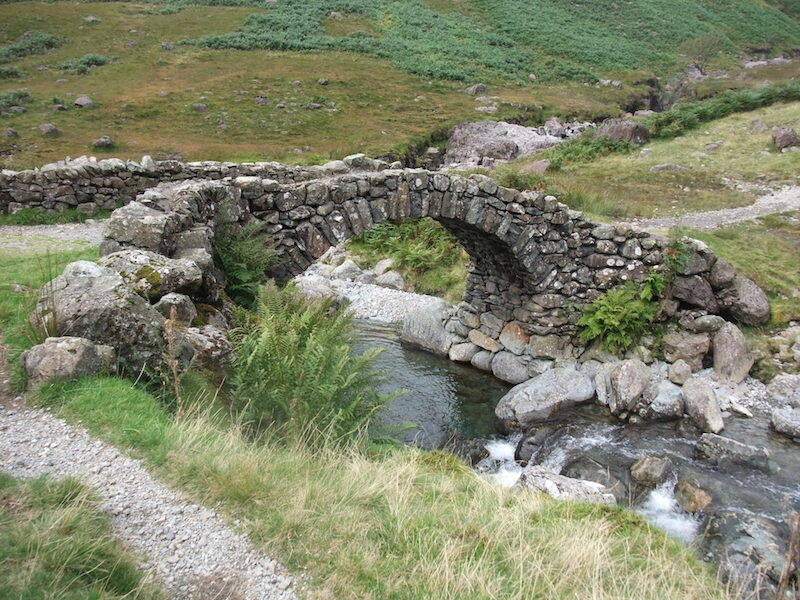 Lingcove Bridge and sheepfold opposite. 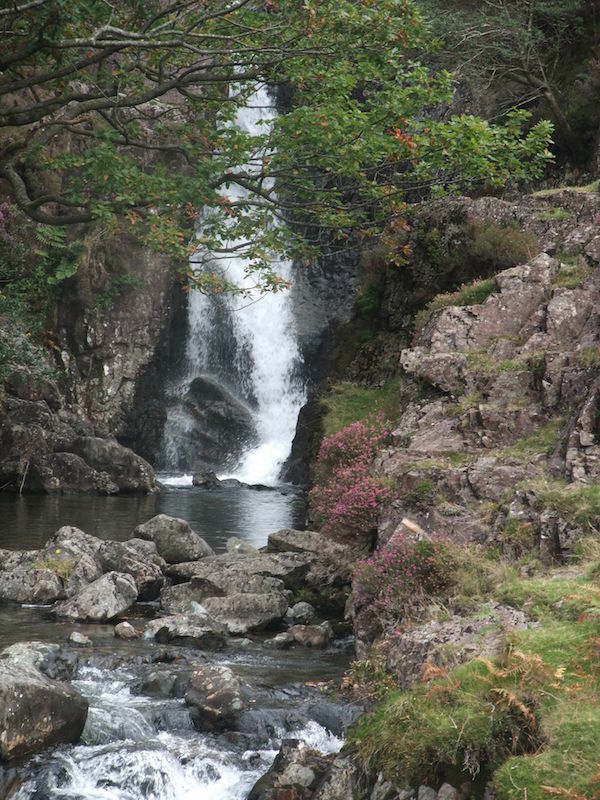 Waterfall and pool just above Lingcove Bridge. It looked inviting but we didn’t accept the invitation. 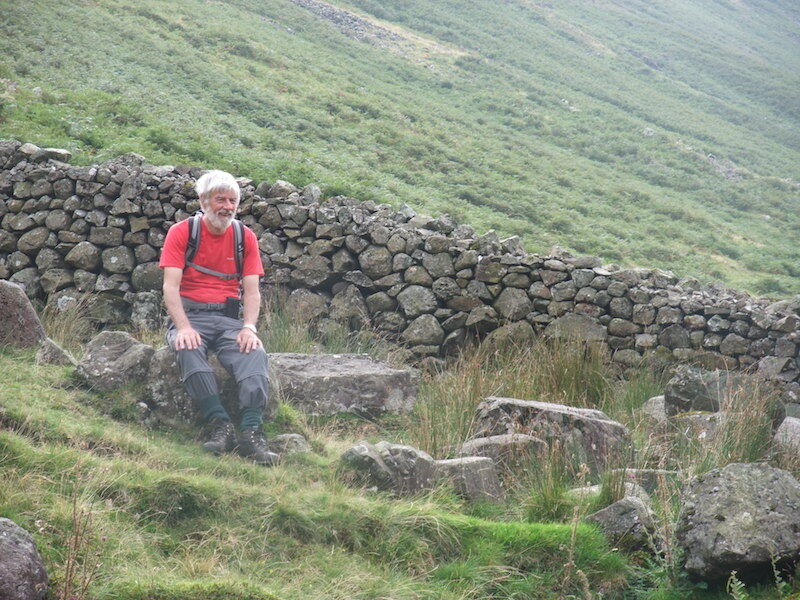 Plenty of seating at the sheepfold, and a nice place to stop for a short break. 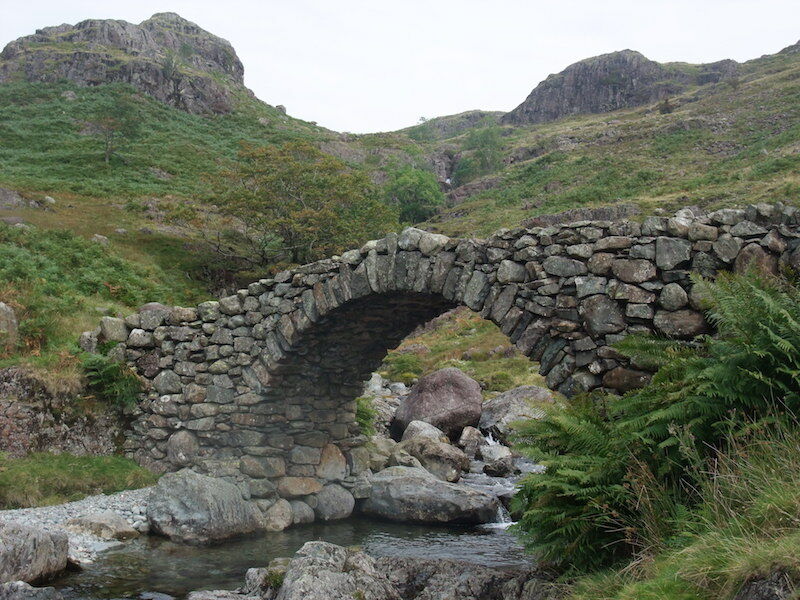 Lingcove Bridge with Throstlehow Crag to the left. Another view of Lingcove Bridge. 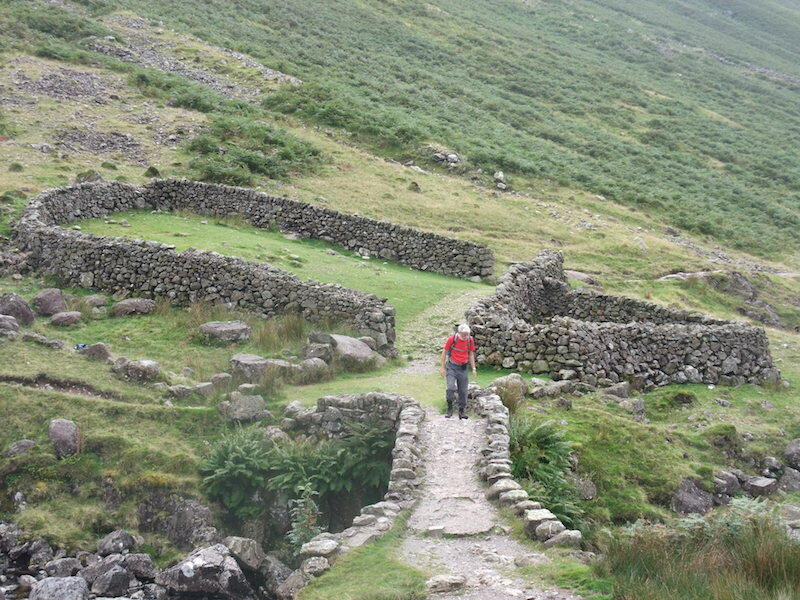 Its an old packhorse crossing and how long it has been here I have no idea. It looks almost too slender to carry the weight of heavily laden horses. Strength and elegance combined, they knew how to build ’em in them days eh? 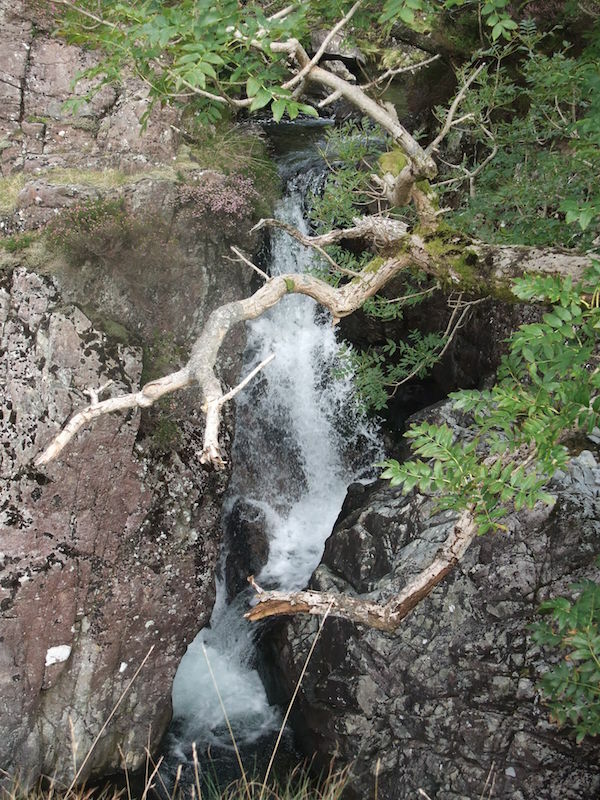 When we left the bridge we kept close to the side of Lingcove Beck to view the waterfalls, so here are a couple views of them …..
Not such a good view of this waterfall, I couldn’t get a clear shot as there were dead branches everywhere. 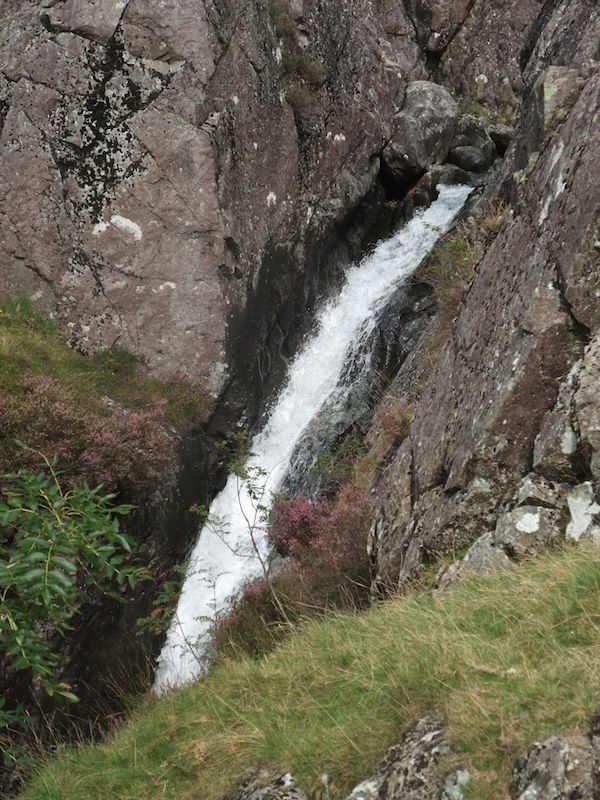 Further up Lingcove Beck, we’re past the waterfalls now and heading up into more rugged countryside. Little by little the views we have come to see begin to appear, and all you can do is simply gaze at them. 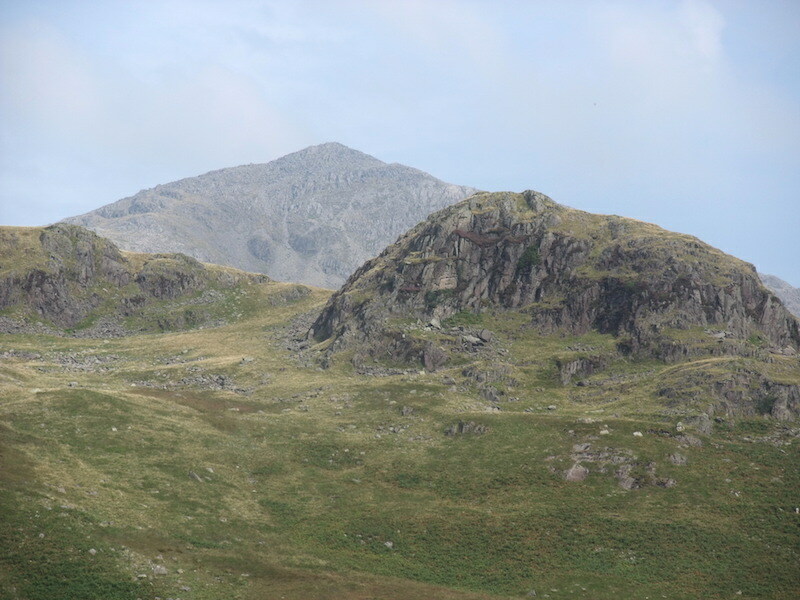 A rather hazy view of Bowfell. 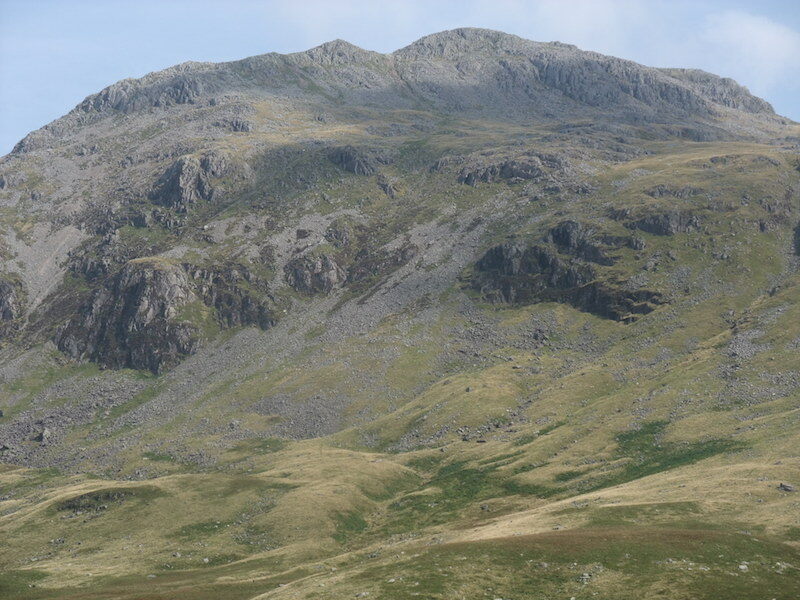 Scafell Pike, Broad Crag and Ill Crag begin to appear as we climb higher up the northern slopes of Hard Knott. They look almost near enough to reach out and touch but they are a good distance away. 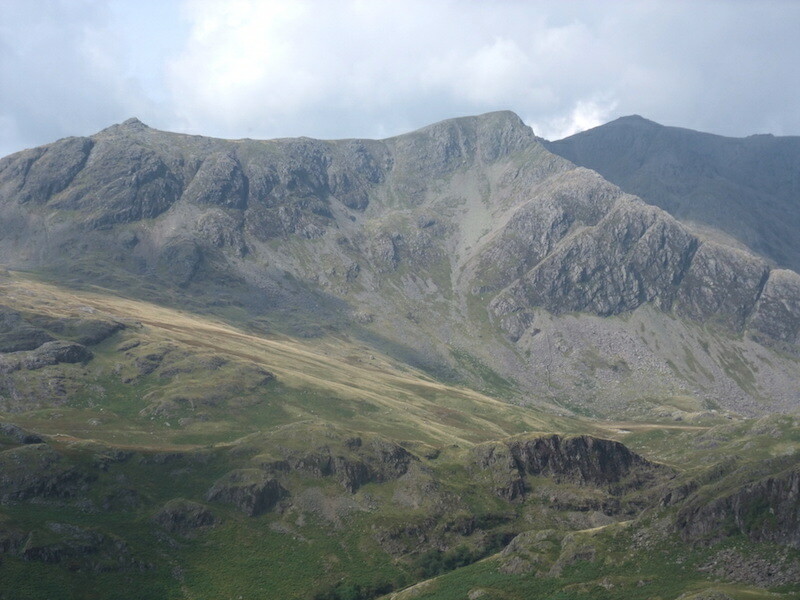 Another view of Bowfell from Hard Knott. 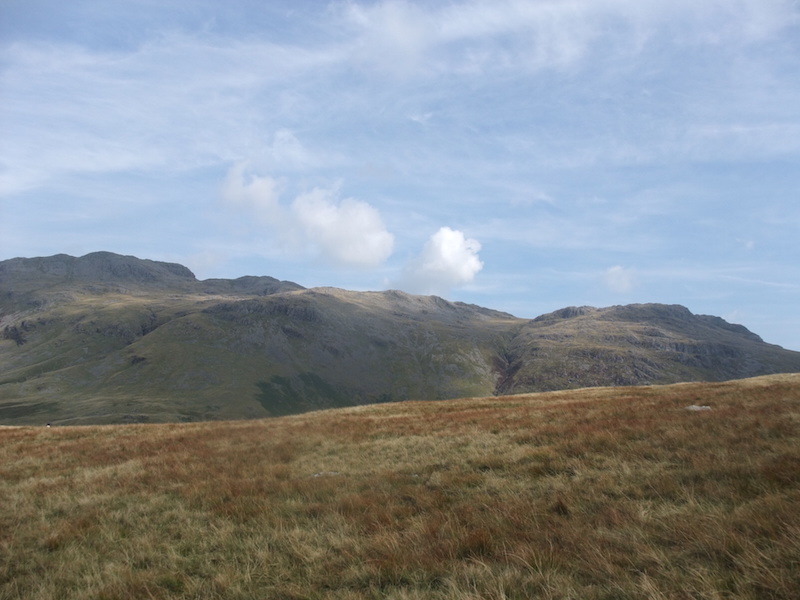 Scafell Pike, the highest peak in England, is on the right and drops down to Mickledore, the connecting ridge on the centre skyline. 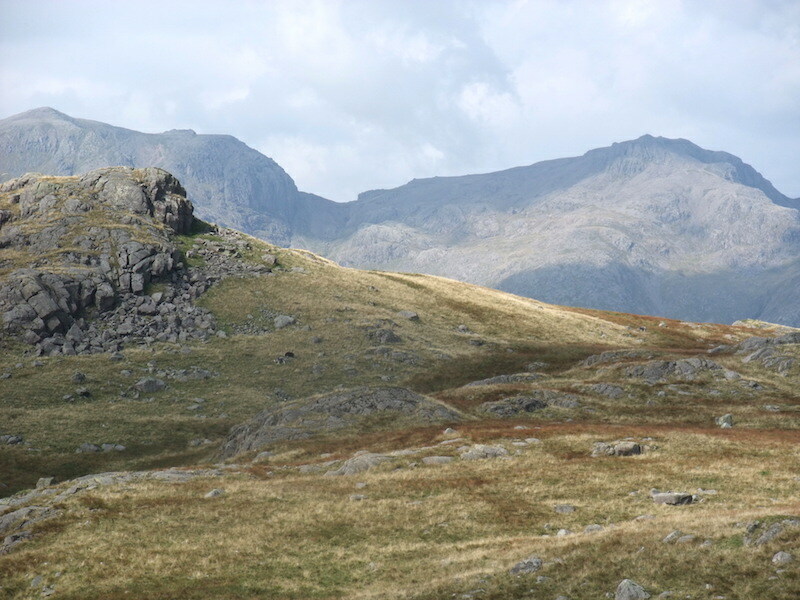 The bulbous lump of rock on the skyline to the left is Broad Stand, the northern end of Scafell. 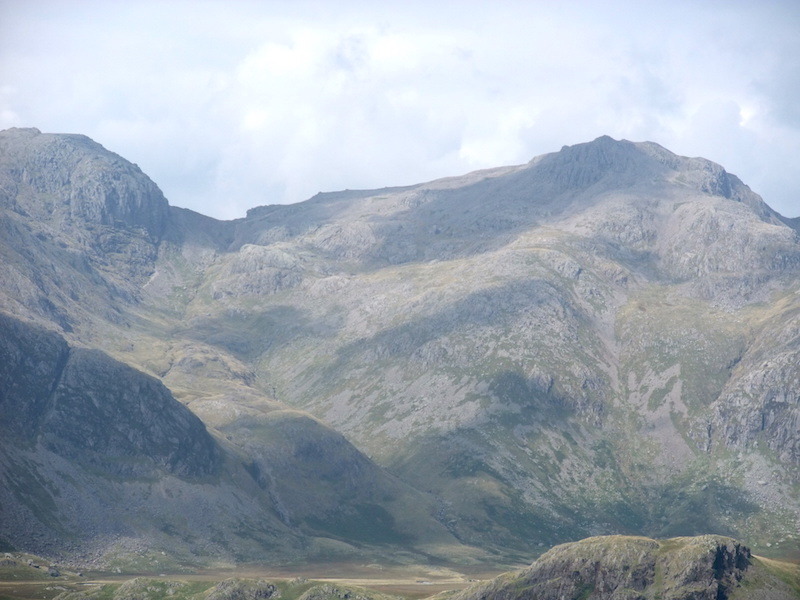 Scafell is about a dozen or so metres lower than its big brother, Scafell Pike. 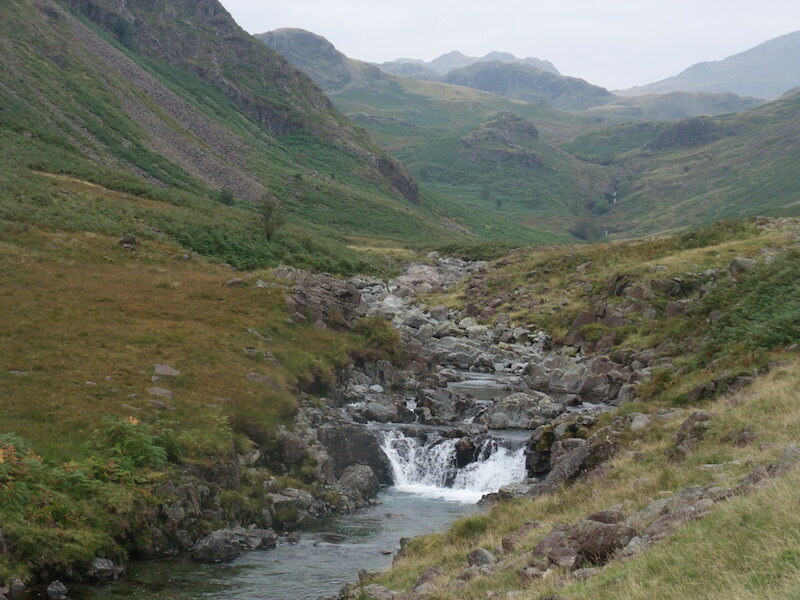 You might think just by looking at this view, that it would be simply a case of walking from Scafell Pike across Mickledore and then climbing up to Scafell, but it isn’t. 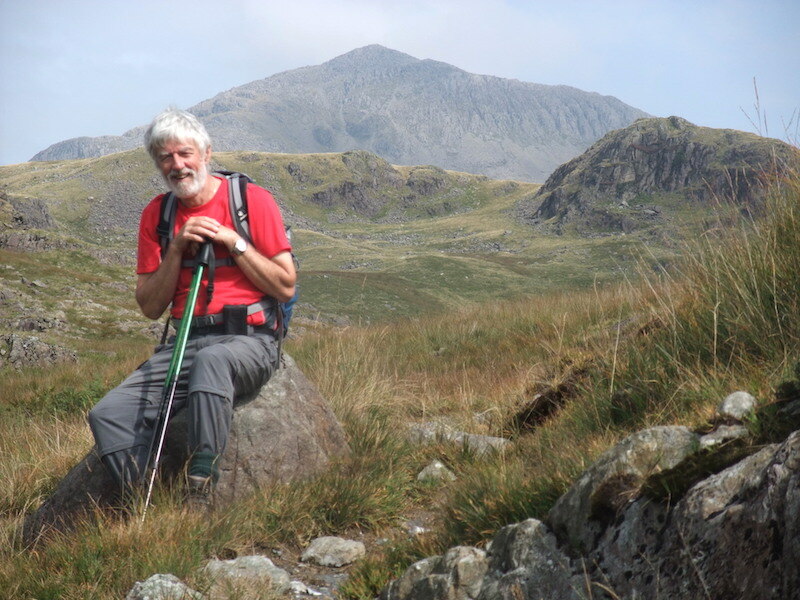 Ascending is described as ‘Difficult’ in the climbing grading system, and descending without ropes and all the other climbing tackle is not to be attempted. People have tried and come to grief, it just isn’t a route for walkers. 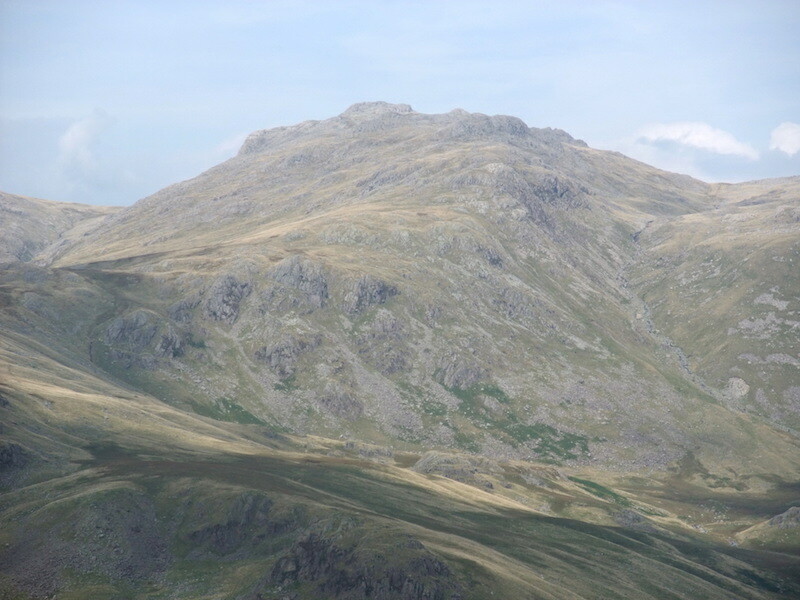 Here we have a view of the last Crinkle at the northern end of Crinkle Crags. 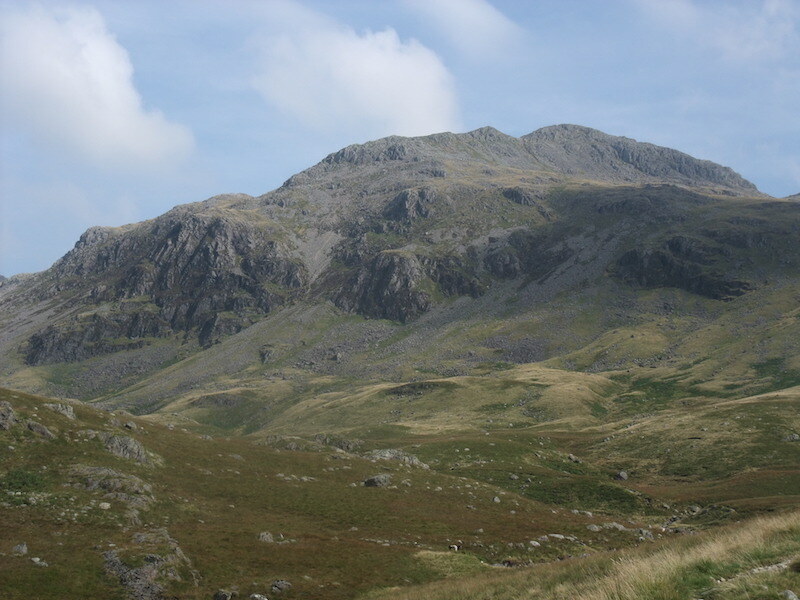 Bowfell, mighty, omnipresent and a jaw-dropping sight if ever there was one. 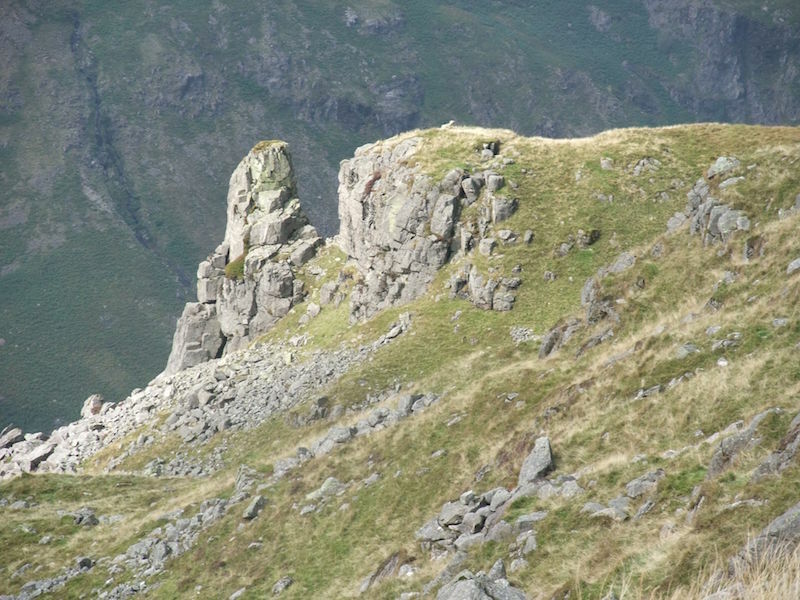 A close up view of the northern end of Crinkle Crags. 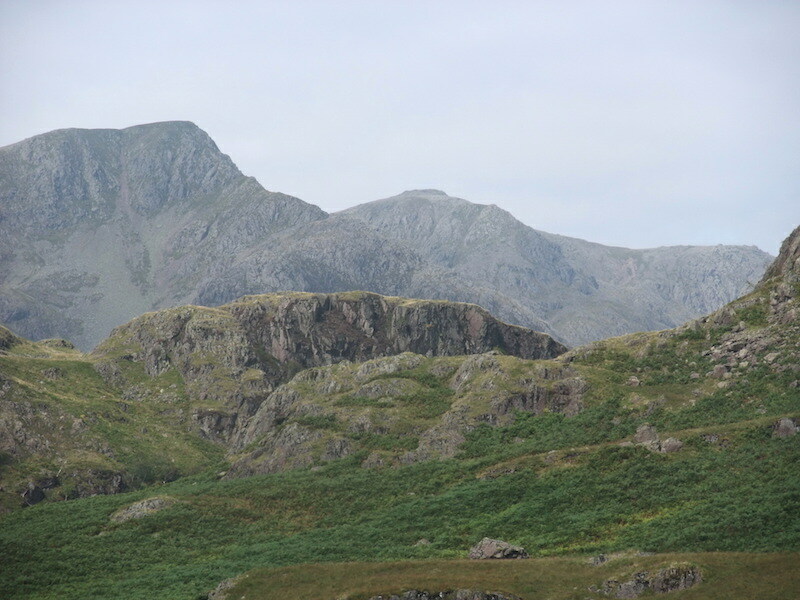 Slight Side on the left getting a splash of sun, Scafell is in shadow over on the right. 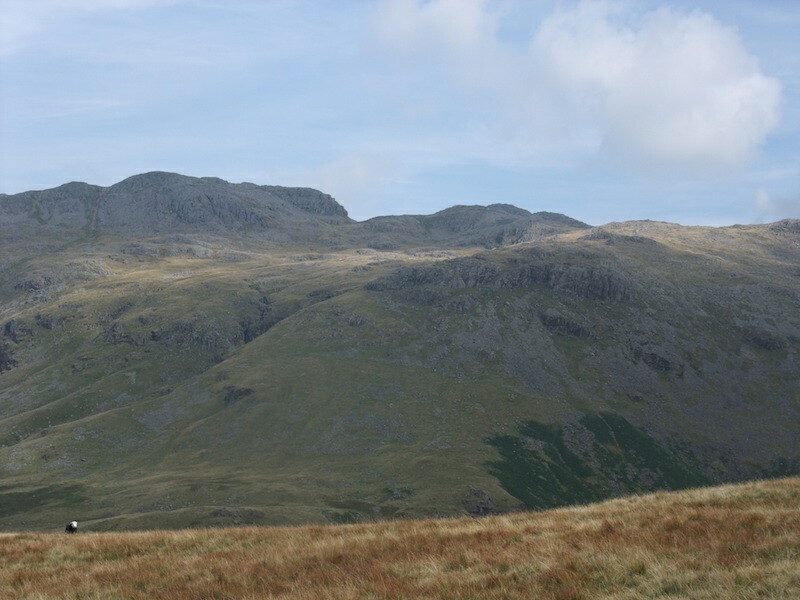 Looking across at the southern end of Crinkle Crags from Hard Knott …..
….. and to my left, the middle section of Crinkle Crags. 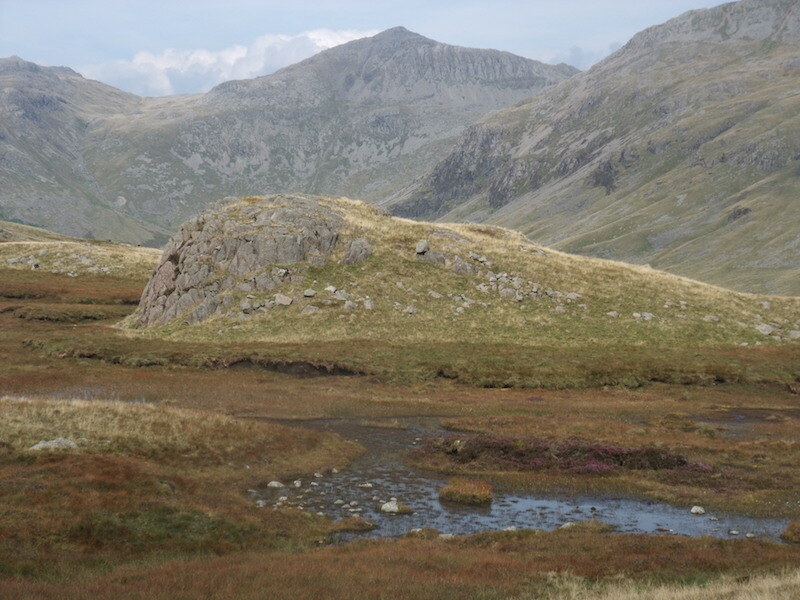 A Herdwick, at the bottom left, is giving me a hard stare. 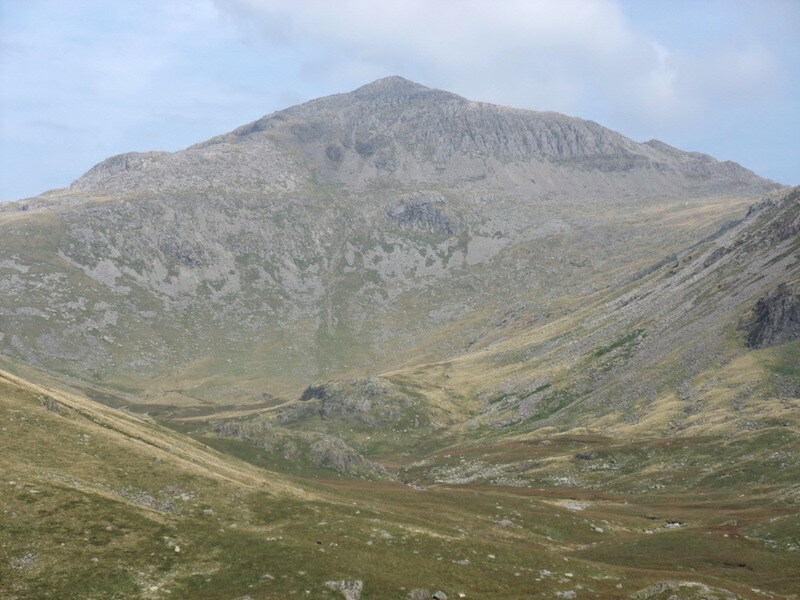 This is Bowfell’s next door neighbour, Esk Pike. No less impressive, as its only a few metres lower, but it always looks a lot friendlier. The word ‘awesome’ is over-used these days, often to describe what can only be regarded as trivia, this is what awesome truly describes. It is a magnificent sight, staggeringly impressive, and really does take your breath away. 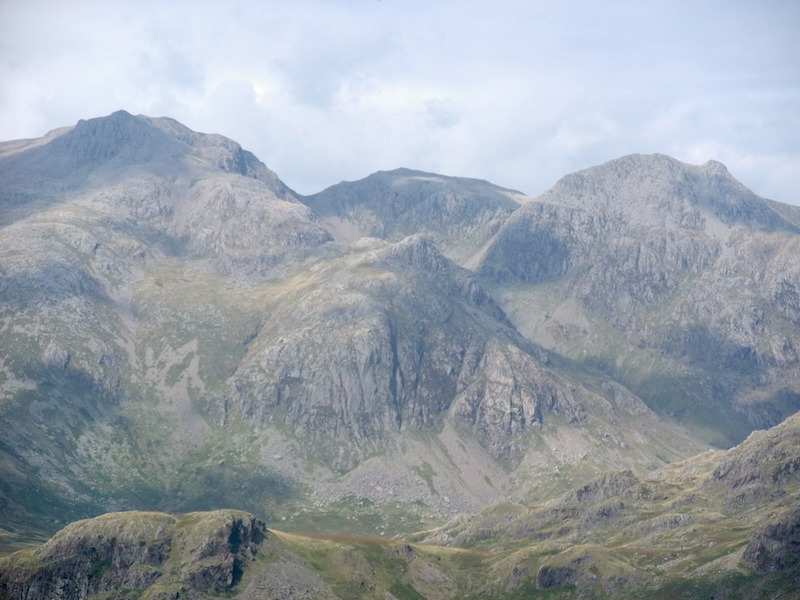 From left to right on the skyline the view is of Scafell Pike, Broad Crag and Ill Crag. 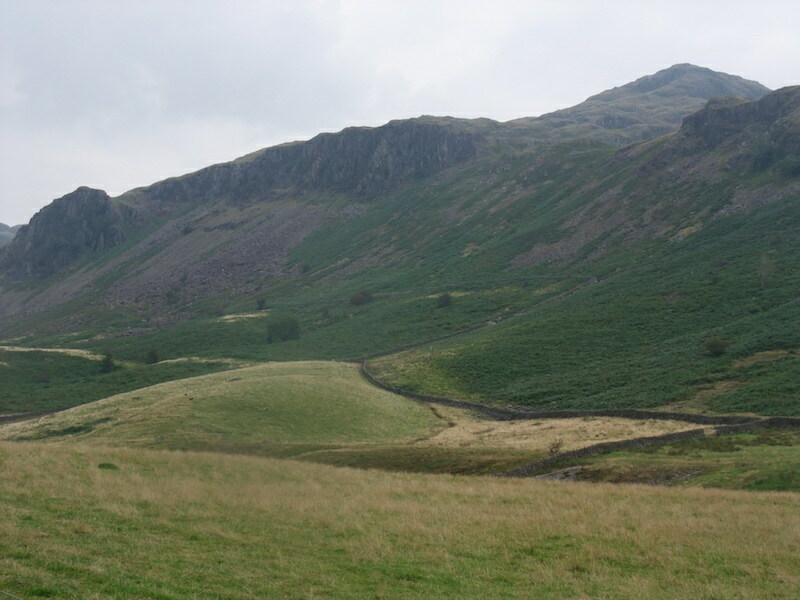 Below Broad Crag is Pen. 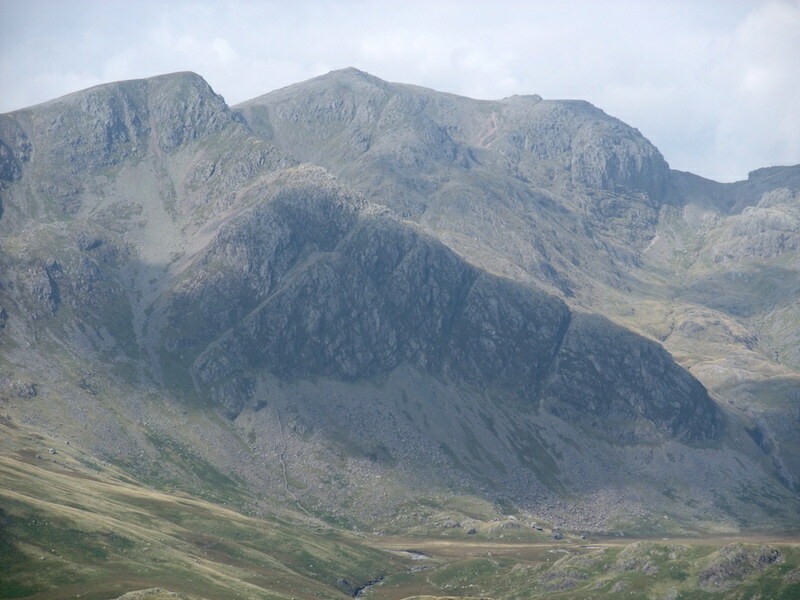 A closer look at Scafell Pike and Mickledore …..
….. and to the left of them is Scafell over Cam Spout Crag. 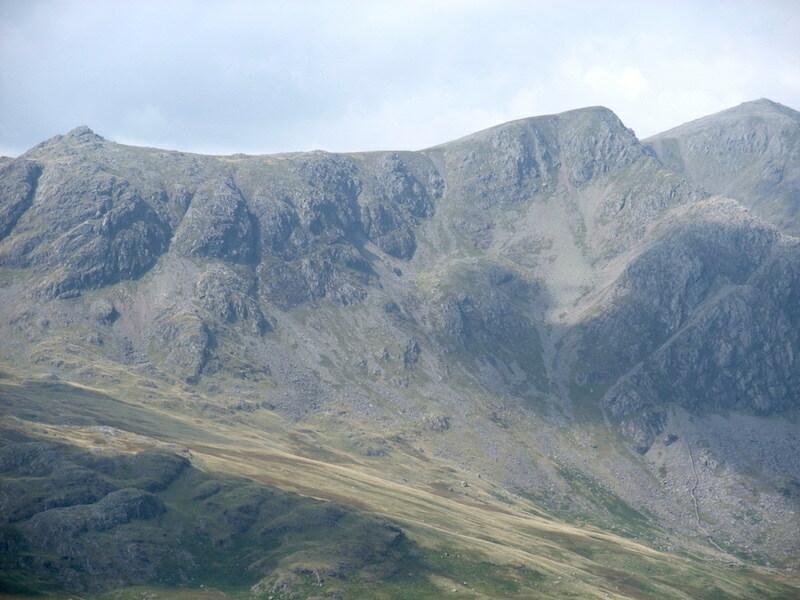 Slight Side on the left with part of Scafell on the extreme right and Cam Spout Crag in between. We sat for quite a while just looking and thinking of the forces which created this amazing landscape. With some reluctance we eventually moved on and continued our walk. 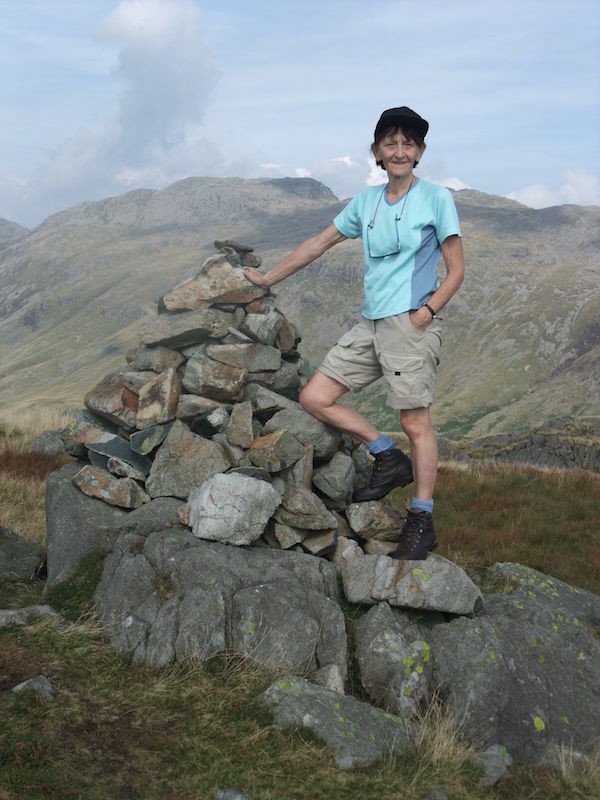 We’ve reached the top of Hard Knott, although we’re not at the summit yet, and the walk has flattened out onto what can be a very wet area. 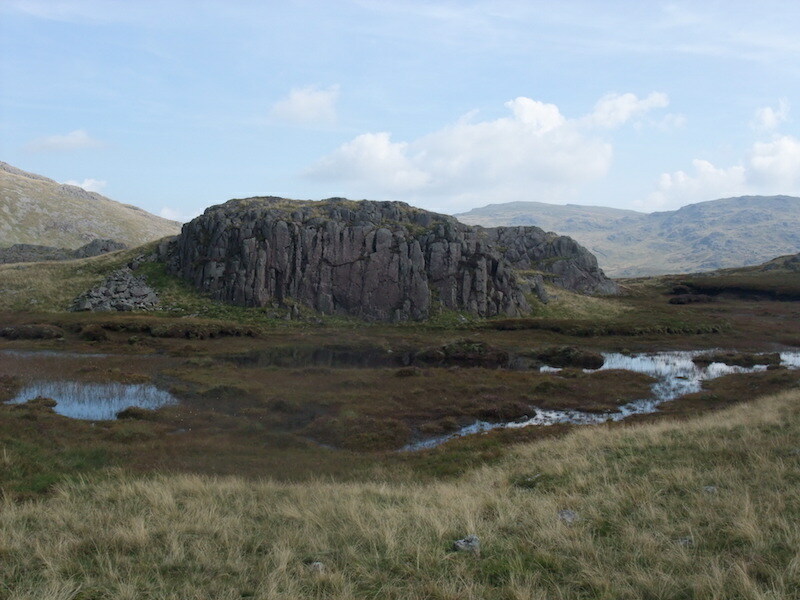 The lack of rain has resulted in this rather forlorn looking and almost empty tarn. 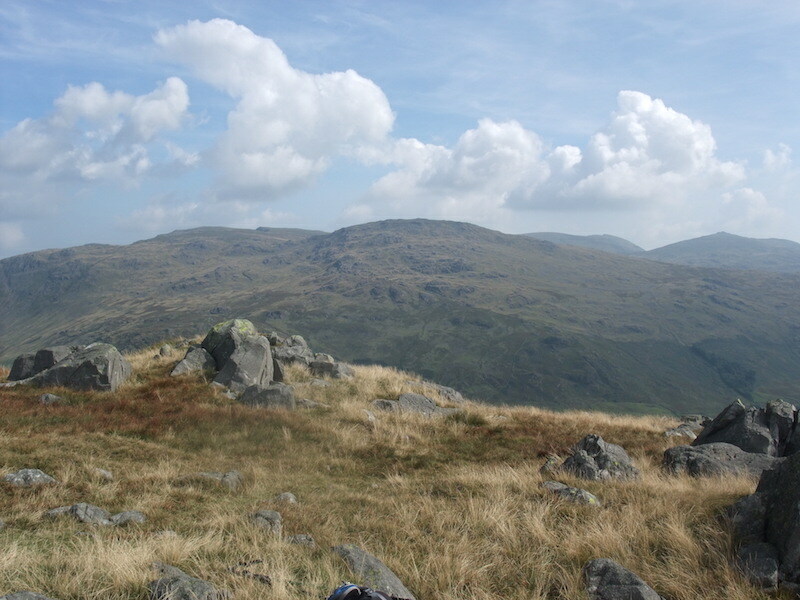 Grey Friar is behind on the left and Harter Fell is in the distance to the right. Another view of the tarn as we continue on our way. Making good progress across the dry ‘wet’ area, no wet feet today at least. I know, I know, but I couldn’t resist another couple of shots ….. 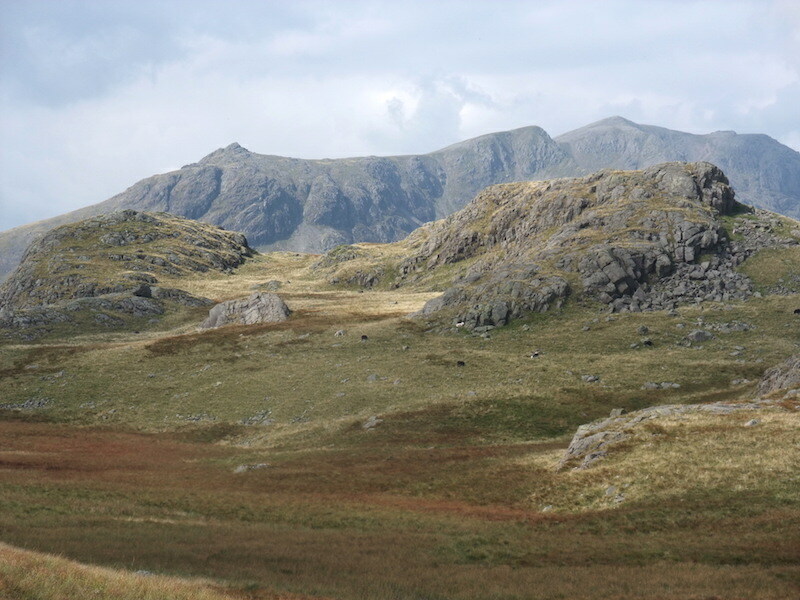 Looking across to the Coniston Fells from Hard Knott, this is the view to the south east of us. We eventually reach Hard Knott summit, but we weren’t in any great hurry, there’s been so much to look at along the way, and the weather is lovely, so we didn’t really mind how long it took us. From the summit we dropped down a little way where I took this close up of the Eskdale Needle. A longer view of the Needle to give an indication of its position and its stunning backdrop. 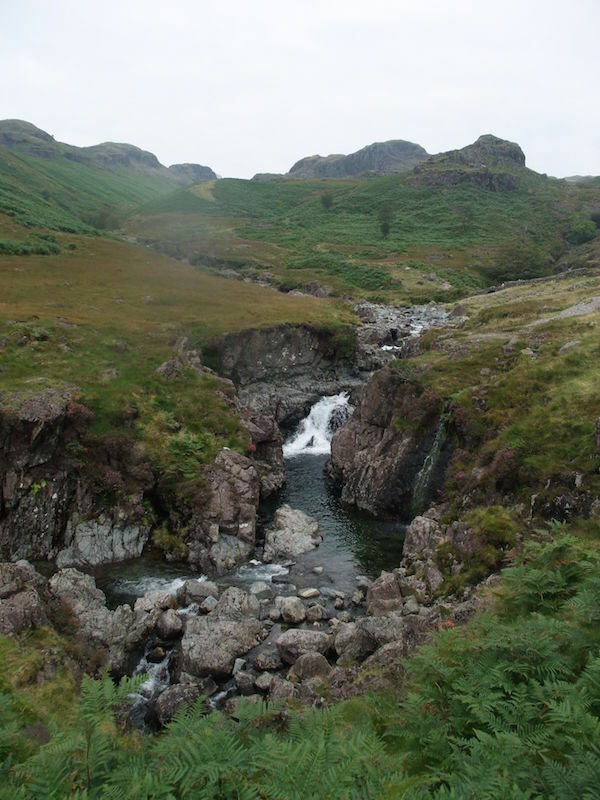 Eskdale is a long way down below between the two. 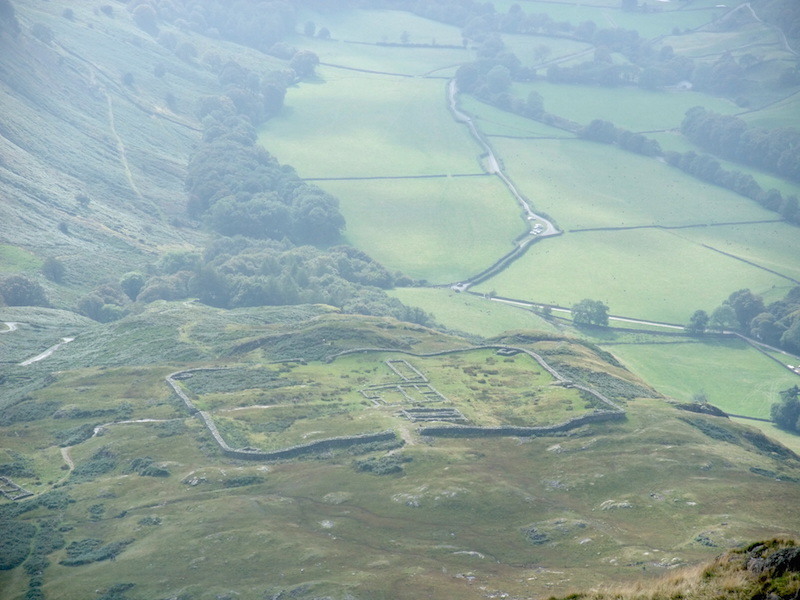 We made another small detour over to Border End for this bird’s eye view of the Roman fort of Mediobogdum. They could certainly keep an eye on things from that position. 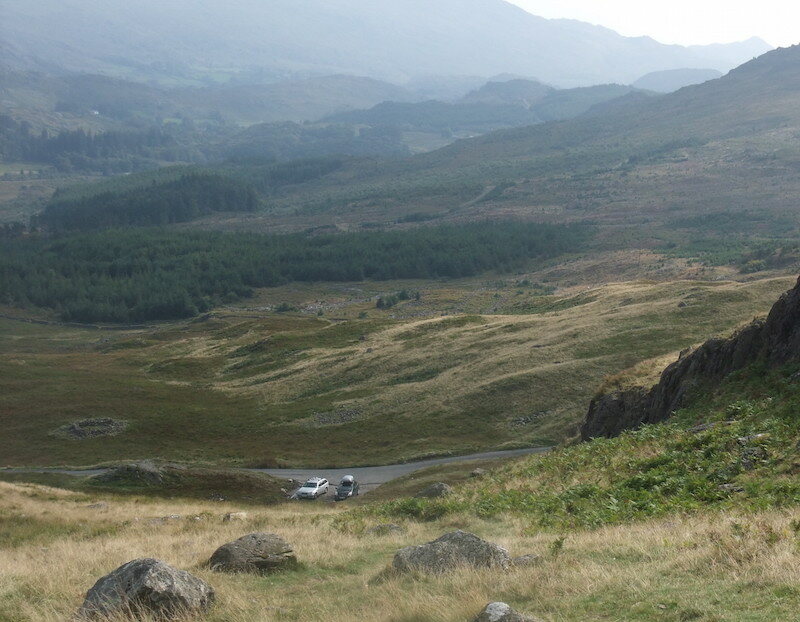 The car is parked down there in the first little lay-by along the road. From Border End it was just a short walk back to pick up the grassy path down to Hard Knott Pass. 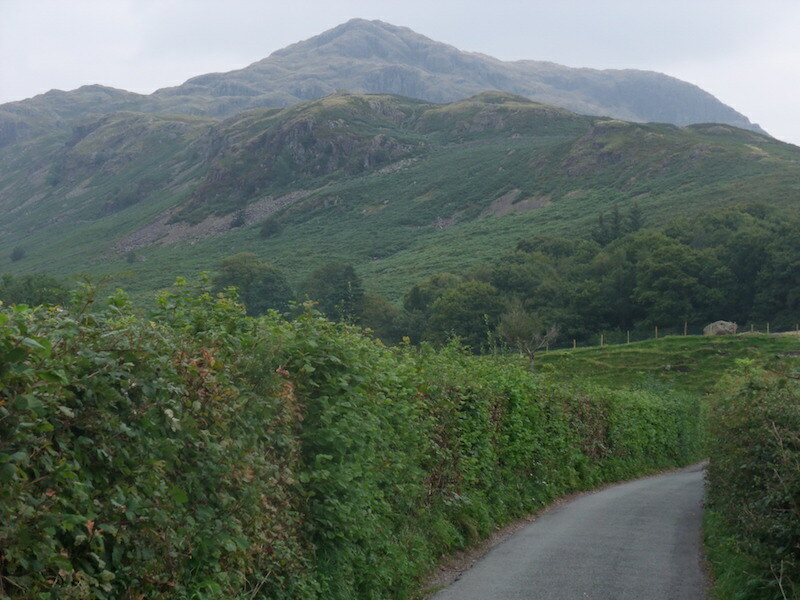 This route is the quick way up to Hard Knott summit, the distance from the road to the summit is three quarters of a mile, so if you’re in a hurry that’s the way to go. 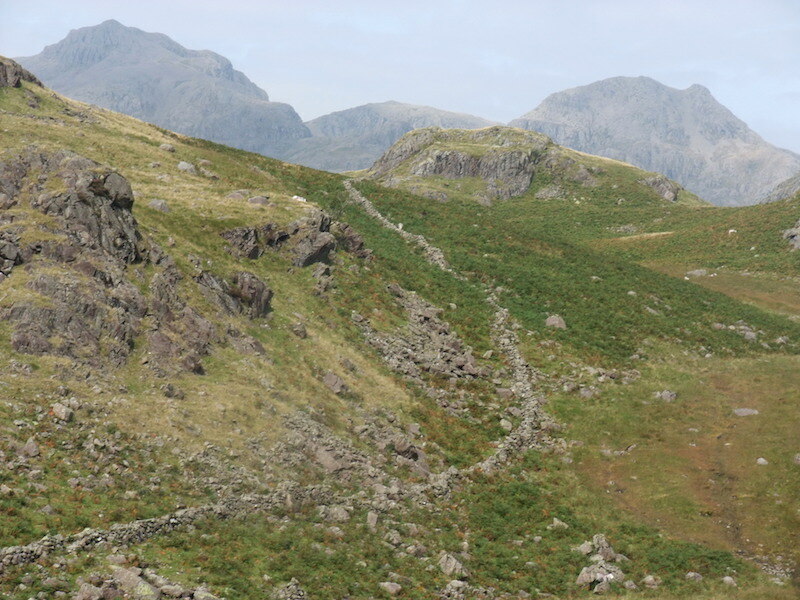 We walked down the Hard Knott Pass for a short way and then diverted onto a path which took us over to the old Roman fort. We had a quick look round it but I didn’t take any photos. We’ll just have to come back again then, won’t we? Yes, we certainly will because its a wonderful area and we’ve had an absolutely fabulous time walking in it.